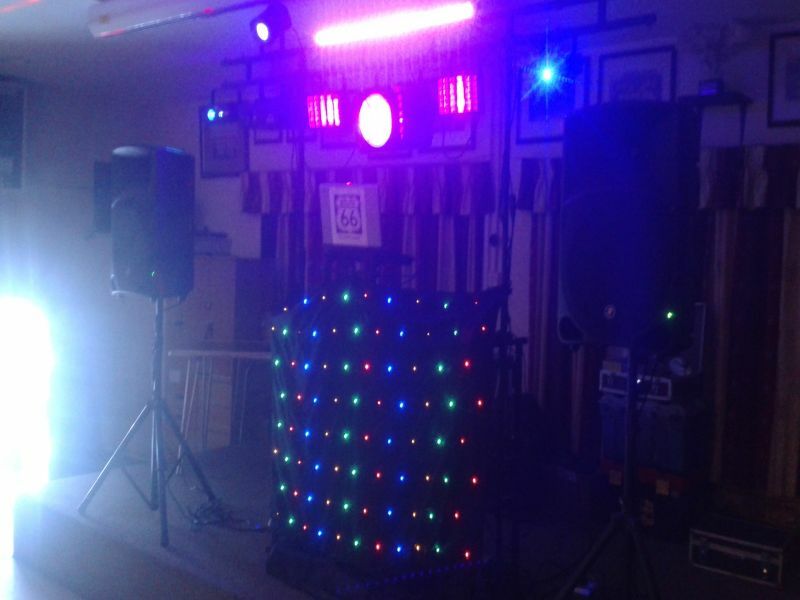 "A Mobile Disco For All Occasions 100% Reliable"
A mobile disco for all occasions and tastes. Quality sound and light show with LEDs, lasers, UV bar, music from the 50s to the present charts. The picture is only a small set up depending on size of venue the show get bigger to fill most stages etc.. I use a powerful mackie sound system, 3000watts max so sounds are never a problem and a professional light show I pride myself on being reliable and smart presentation at all gigs and the same dj myself will always turn up but always a reasonable price. Required by many venues, Route 66 Roadshow has a current PLI policy with DJGuard / in the amount of £2 million. Also required by many venues, Route 66 Roadshow has supplied satisfactory evidence of holding current PAT inspections of their equipment dated within the last 12 months. A Method Statement, outlining Route 66 Roadshow&apos;s Health & Safety procedure for setting up disco equipment has not been supplied. Why do people choose to book Route 66 Roadshow? They were very quick to respond and the most reasonable. Reasonably priced, with good feedback reviews. Very timely and informative with his communications. Seems to suit exactly what we are after for a very good price! Amazing price .!! Very friendly when on the phone :! "Clive was fantastic all evening, great music and had nearly everything requested. Would definitely recommend to anyone needing a dj. " "GLAD YOU ENJOYED THE DISCO THANKS"
"This was a joint party for myself and stepson, 40th and 60th. The ages of guests ranged from 2yrs today mid 80's and we all had a fab time, would highly recommend Clive from route 66, thankyou for a great birthday bash"
"glad you all enjoyed the disco cheers "
"An amazing dj, did well for the kids aswell as the adults .. such a good price aswell , he was amazing and I wouldn’t book anyone else in the future .! " "glad you all enjoyed the disco thanks. " "Went above and beyond to make our event perfect. Very ameanable and patient." "Clive was amazing... pleated good music all the night! Loads of positive feedback from our guests"
"glad you enjoyed the disco cheers "
"This disco was great good value for money dealt with all requests and very punctual would definitely use again "
"THANKS for your support great venue choice "
"Route 66 DJ Clive is a great guy would definitely recommend for your celebration, on time great music and friendly thanks Clive for a great night." "thanks great night had by all enjoyed the party lol "
"Booked Clive for a surprise 60th birthday party. He got the party going when the birthday girl walked in by playing the right entrance music and set the scene for a great night. A real good selection of music for the occasion and at a reasonable price.Highly recommended. " "thanks for your input i enjoyed the party glade you liked it cheers "
"Brilliant night, friendly, helpful and professional. Couldn't ask for more "
"thanks for your comments excellent night "
"Set up with minimum fuss and quickly. Playlist was sent prior the event. Music was excellent and plenty of good dance music for all ages. " "thanks for your responce glad you all enjoyed the disco cheers"
"Was a really good night with mixed music genre. " "The DJ said that as there was not many people there and wanted to leave at 11 and not 1am i said no he wasnt going to leave so he did stay over all he was good and would book again"
"thanks for your feedback glad you enjoyed the music "
"Great night , Clive was on time and everything was as promised , good value, we would book route66 again"
"glad you all enjoyed disco thanks again"
"Clive was fantastic!!! From ease of booking to song requests and brilliant value for money. Have used many a dj over the years but Clive at route 66 will be getting all our business from now on. Thank you very much for a brilliant and memorable evening! Everyone commented on the great song list selection for a 70th birthday"
"glad you all enjoyed the disco excellent stuff"
"Clive was very professional in all aspects the music that he played perfectly matched the occasion we would definitely use him again and would recommend to others cheers for a great evening"
"glad you all enjoyed the disco thanks again"
"thanks for your support glad you all enjoyed it"
"DJ was very good. I requested a certain list of music which was played by the dj. The DJ had very good music and lighting equipment." "thanks for your support great night"
Get FREE no-obligation disco quotes from Route 66 Roadshow and other DJs covering your venue. Take 2 minutes to fill in some basic details and we'll do the rest! If you are contacting Route 66 Roadshow about an event, it's always a good idea to include the DATE, LOCATION, EVENT TYPE, AGE GROUP and TIMINGS to speed things up!